About company | TEZAS servis a.s.
History and present time of TEZAS servis a.s. The rich history of TEZAS service a.s. dates back to 1953, when independent enterprise were established under former ČSAD. In Prague 8 – Karlín, Podnikový sklad a opravny (Warehouse and Service Station) was established, including the bus and truck repair workshop in Satalice. As of April 1963, ČSAD KNV Praha n.p. was established, and the plant operating in Prague 8 was renamed to Technický a zásobovací závod, after ten years of operation. The joint-stock company with the business name of ČSAD Technické a zásobovací služby Praha a.s. was established by the Czech National Property Fund within the 2nd round of voucher privatization on February 1994. The name was later changed to ČSAD TZS Praha, a.s., and then shortened to TEZAS a.s.
TEZAS servis a.s., established in 2010, is a subsidiary of TEZAS a.s. It resumed the traditional corporate values and successfully continues the activities of its parent company, as regards sales, servicing and manufacturing. TEZAS servis a.s. currently has 80 employees. The company has its main operating premises in Prague 9, Satalice, where all its current activities are concentrated. There is the sales department in charge of the distribution of IVECO Bus and IVECO chassis. 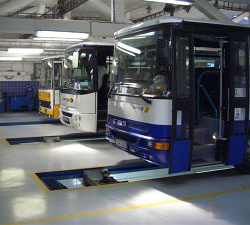 In addition, there is an authorized service station for IVECO Bus and Solaris. The central warehouses located within the premises offer a wide range of spare parts for IVECO Bus, Irisbus and KAROSA. In addition, it offers truck accessories, spare parts, metallurgical material, brake pads, refurbished spare parts and technical rubber. Customers are also welcome to make use of the bus and truck washing line. 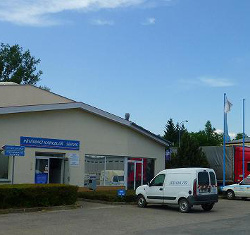 TEZAS servis has its sales and service outlet in Boskovice. The service centre specializes in routine servicing of buses IVECO Bus, Irisbus and KAROSA, verification of digital and analogue tachographs, and the sale and servicing of THERMO KING cooling equipment. 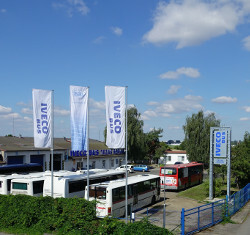 Since 1999, the company has been repeatedly awarded the best dealer of IVECO Bus (currently Irisbus and KAROSA) in the Czech Republic. In addition to commercial success, we constantly strive to ensure maximum satisfaction among our customers. We therefore focus on quality management and improvement in the quality of our servicing operations. The high level of the services rendered is proven by the obtained certificates and the introduction of the quality system according to ISO 9001:2008 and 14001:2004.